Bone morphogenetic proteins (BMPs) and transforming growth factor-βs (TGF-βs) are important regulators of bone repair and regeneration. BMP-2 and TGF-β1 have been shown to inhibit gap junctional intercellular communication (GJIC) in MC3T3-E1 cells. Connexin 43 (Cx43) has been shown to mediate GJIC in osteoblasts and it is the predominant gap junctional protein expressed in these murine osteoblast-like cells. We examined the expression, phosphorylation, and subcellular localization of Cx43 after treatment with BMP-2 or TGF-β1 to investigate a possible mechanism for the inhibition of GJIC. Northern blot analysis revealed no detectable change in the expression of Cx43 mRNA. Western blot analysis demonstrated no significant change in the expression of total Cx43 protein. However, significantly higher ratios of unphosphorylated vs. phosphorylated forms of Cx43 were detected after BMP-2 or TGF-β1 treatment. Immunofluorescence and cell protein fractionation revealed no detectable change in the localization of Cx43 between the cytosol and plasma membrane. BMP-2 and TGF-β1 do not alter expression of Cx43 at the mRNA or protein level. BMP-2 and TGF-β1 may inhibit GJIC by decreasing the phosphorylated form of Cx43 in MC3T3-E1 cells. Bone morphogenetic protein-2 (BMP-2) and transforming growth factor-β1 (TGF-β1), members of the TGF-β superfamily, play important roles in bone repair and regeneration [1–4]. BMPs, defined as osteoinductive by their ability to induce osteogenesis when implanted in extraskeletal sites, are thought to mediate the transformation of undifferentiated mesenchymal cells into bone-producing osteoblasts. BMP-2 and TGF-β1 promote osteogenesis in vivo and have been applied exogenously to accelerate healing of bony defects in various animal models [5–8]. Gap junctional intercellular communication (GJIC) represents one mechanism of cell-cell communication and has been implicated in the maintenance of intercellular homeostasis and regulation of signals during embryogenesis, differentiation, growth, and regeneration [9–11]. Gap junctions have been shown by electron microscopy to exist between osteoblasts and osteocytes in homologous and heterologous cell populations [12–14]. Gap junctions are thought to be essential for maintaining skeletal integrity and coordinating repair of osseous tissue by propagating intracellular signals generated in response to soluble factors, such as epidermal growth factor (EGF) and basic fibroblast growth factor (bFGF), or mechanical stimuli, such as cyclic stretch [15–18]. Connexins are the structural subunits of gap junctions  and connexin 43 (Cx43) has been shown to mediate intercellular communication in osteoblasts . In a previous study, we reported that BMP-2 or TGF-β1 markedly inhibited GJIC in the murine-derived MC3T3-E1 cell . Cx43 is the predominant gap junctional protein expressed in this cell line and we hypothesized that Cx43 mediated intercellular communication in these osteoblast-like cells. In this study, we describe the effects of BMP-2 and TGF-β1 on the expression, phosphorylation, and subcellular localization of Cx43 in MC3T3-E1 cells. Northern blot analysis revealed no significant difference in the steady state level of Cx43 mRNA after treatment with BMP-2 or TGF-β1 at either 24 or 48 h when standardized to GAPDH as control (Fig. 1). 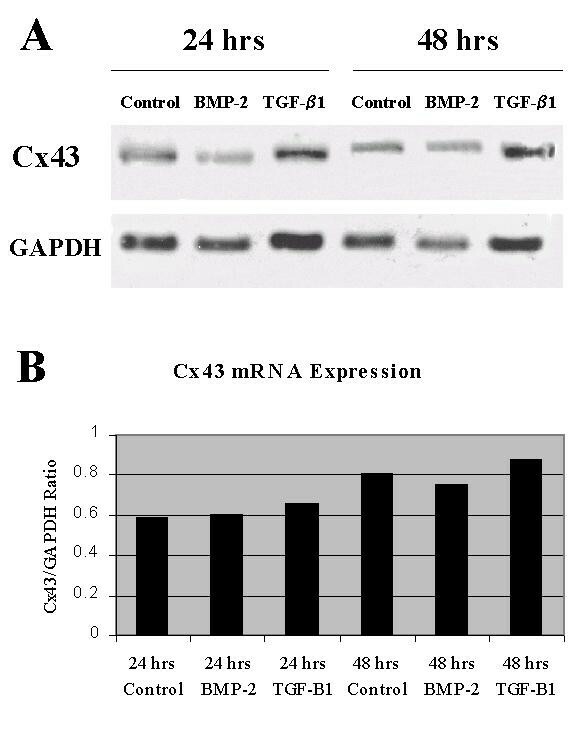 Effects of BMP-2 and TGF-β1 on Cx43 mRNA expression. A. Northern blots demonstrating Cx43 expression for control, BMP-2, and TGF-β1 groups after 24-h and 48-h treatments (top panel), with GAPDH control (bottom panel). B. Graphic representation of Cx43 mRNA expression normalized to GAPDH. 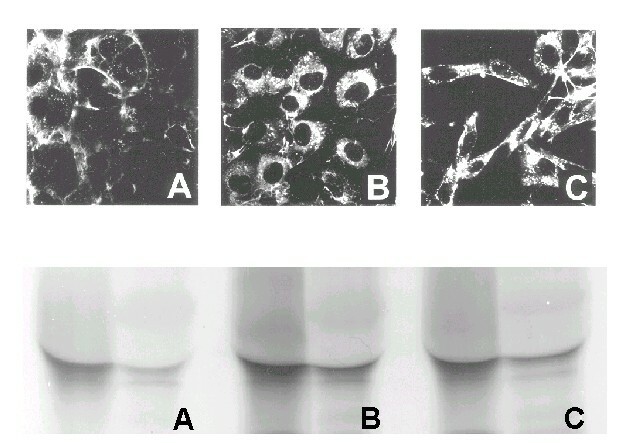 Western blot analysis with anti-Cx43 antibody revealed prominent bands at 43 kD and 46 kD (Fig. 2). The addition of ALP increased the density of the 43 kD band in comparison to the 46 kD band in all groups (Fig. 2, even-numbered lanes). Effects of BMP-2 and TGF-β1 on the expression and phosphorylation of Cx43 protein. Western analysis of Cx43 protein expression for control, BMP-2, and TGF-β1 groups after treatment for 24 h (top panel) and 48 h (bottom panel) in the absence (-) or presence (+) of ALP. Experiments suggest that 43 kD and 46 kD bands represent the unphosphorylated and phosphorylated forms of Cx43, respectively. After 24 and 48 h of BMP-2 treatment, there was no significant change in total Cx43 protein expression. However, BMP-2 treatment increased the density of the 43 kD band relative to the 46 kD band at 24 h, and at 48 h (Fig. 2, lane 3). This effect was accentuated with the addition of ALP. At 48 h, TGF-β1 slightly increased total Cx43 protein expression but markedly increased the density of the 43 kD band compared to the 46 kD band (Fig. 2, lanes 5 and 6), resulting in a significant increase in the 43 kD: 46 kD ratio (Fig. 3). This increase in the Cx43 43 kD: 46 kD isoform ratio was magnified in the presence of ALP. The effect of TGF-β1 at 24 h was similar but not statistically significant compared to control. Densitometric analyses of total protein expression and the 43 kD: 46 kD Cx43 isoform ratio are summarized in Fig. 3. Densitometric analysis of Cx43 expression. Total Cx43 protein expression (left) and the ratio of the 43 kD: 46 kD bands (right) normalized to control levels. Values are mean ± S.D. of 3 separate experiments with control set at 100% (* p < 0.05 compared to control). Immunofluorescence revealed Cx-43-specific staining intracellularly and on the cell surface. We did not observe any difference in localization after treatment with BMP-2 or TGF-β1 with this modality (Fig. 4, top panel). 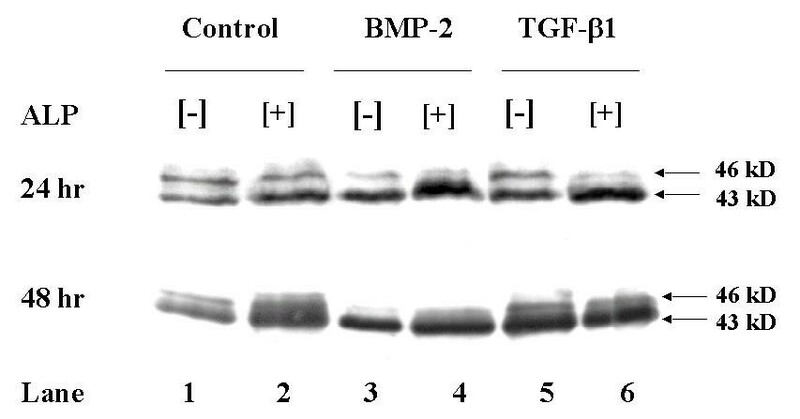 TGF-β1-treated cells exhibited an elongated shape compared to the control and BMP-2-treated groups. Subcellular localization of Cx43. MC3T3-E1 cells were treated with A. PBS vehicle (control), B. BMP-2, or C. TGF-β1 for 48 h. Immunofluorescent localization of Cx43 visualized with epifluorescence microscopy (top panel). Immunoprecipitation of Cx43 in cytosolic (left lanes) and membranous (right lanes) fractions. The MC3T3-E1 cell has been proposed as an in vitro model of osteoblastic differentiation and maturation [22, 23] and is widely utilized in osteoblast functional studies. In previous studies, we reported that BMP-2 or TGF-β1 treatment as well as multiple cell passages inhibited GJIC in these clonal osteoblast-like cells [21, 24]. Since Cx43 has been shown to mediate cell-cell communication in human osteoblasts , we hypothesized that Cx43 may be an important mediator of GJIC in murine-derived MC3T3-E1 cells. Northern blot analysis revealed no detectable change in the steady state level of Cx43 mRNA expression after treatment with BMP-2 and TGF-β1. Western blot analysis showed that the addition of ALP to untreated control groups increased the density of the 43 kD protein, while decreasing the density of the 46 kD isoform (Fig. 2, lanes 1 and 2). This effect was blunted in the presence of okadaic acid, a phosphatase inhibitor (data not shown), strongly suggesting that the 43 kD and 46 kD bands represent the unphosphorylated and phosphorylated forms of Cx43, respectively . All samples were tested with and without ALP, as previously described, to confirm the phosphorylated isoform, represented by the 46 kD band. The addition of ALP increased the unphosphorylated form (43 kD band) as would be expected. There was no significant change in the expression of total Cx43 protein. 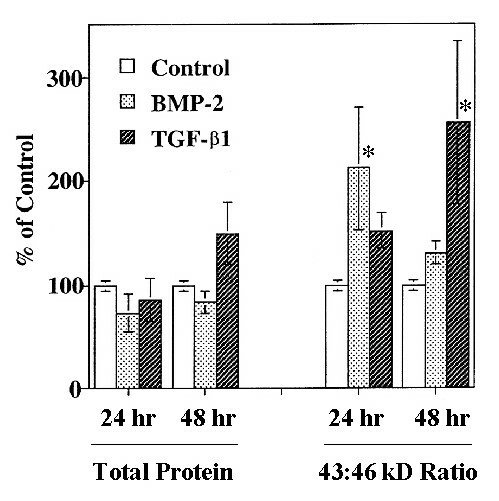 However, both BMP-2 and TGF-β1 increased the density of the 43 kD protein compared to control at 24 h and 48 h (Fig. 2.). These effects were accentuated with the addition of ALP. When expressed as a 43 kD: 46 kD band ratio, both BMP-2 and TGF-β1 significantly increased the ratio of the unphosphorylated: phosphorylated forms of Cx43 at 24 h and 48 h, respectively (Fig. 3.). Immunofluorescence studies showed no observable difference in the localization of Cx43 after BMP-2 or TGF-β1 treatment. Cells treated with TGF-β1 developed an elongated, spindle shape which was a phenomenon reported in our previous study . Since immunofluorescence studies may have lacked the sensitivity to distinguish minor changes in Cx43 redistribution, cell protein fractionation based on detergent solubility was performed. Immunoprecipitation of the cytosolic and membrane-bound protein fractions also showed no significant change in the distribution of Cx43 protein between the cytosol and plasma membrane. Both of these assays suggest there is no significant alteration in the distribution of Cx43 associated with BMP-2 or TGF-β1 treatment. The phosphorylation of Cx43 has been implicated in gap junction assembly and gating events [25–27]. Musil and Goodenough previously reported that communication-deficient cells demonstrated no detectable amounts of the Cx43-P2 isoform (biphosphorylated Cx43) while cells with low gap junctional permeability had detectable amounts of the Cx43-P1 isoform (monophosphorylated Cx43). They speculated that Cx43 phosphorylation correlated positively with cell coupling . Our study also suggests that a decrease in the phosphorylated form of Cx43 (or conversely, an increase in ratio of unphosphorylated: phosphorylated Cx43 forms) may be associated with GJIC inhibition after BMP-2 or TGF-β1 treatment. It is unclear whether phosphorylation of Cx43 is inhibited or dephosphorylation of Cx43-P2 or Cx43-P1 is enhanced. The specific signaling mechanism of BMP-2 or TGF-β1 action is not yet defined and is currently under investigation. GJIC is an important mechanism of cell-cell communication and has been shown to modulate gene expression in osteoblastic cells . The regulatory signals that traverse gap junctions have yet to be defined and may consist of both stimulatory and inhibitory signals . BMP-2 and TGF-β1 have been shown to inhibit GJIC in MC3T3-E1 cells and their effects may be mediated by changes in the phosphorylation of Cx43. The identification of specific signaling pathways and regulatory actions of BMP-2 and TGF-β1 in MC3T3-E1 cells will be important in understanding the role of intercellular communication in bone biology. The MC3T3-E1 cell line was a generous gift from Dr. Gideon Rodan (Merck, Sharpe and Dohme, West Point, PA). Purified human TGF-β1 was purchased from Upstate Biotechnology, Inc. (Lake Placid, NY). Recombinant human BMP-2 and rat heart Cx43 cDNA were generously provided by Dr. Gerard Reidel (Genetics Institute, Cambridge, MA) and Dr. David Paul (Harvard Medical School, Cambridge, MA), respectively. CT-360, a site-directed antibody to the C-terminal amino acids from positions 360 to 382 of the connexin 43 molecule derived from rat cardiac tissue, was generated in rabbit and was a most generous gift of Dr. Dale Laird (California Institute of Technology, Pasadena, CA). MC3T3-E1 cells were plated at 5,000/cm2 on plastic 25 cm2 culture flasks or 10 cm2 round dishes (Costar, Cambridge, MA) or 25 mm2 round glass coverslips in α-MEM medium (Sigma, St. Louis, MO) supplemented with 5% fetal bovine serum, 26 mM NaHCO3, 2 mM glutamine, 100 units/ml penicillin, and 100 μg/ml streptomycin, and grown in humidified 5% C02/95% air at 37°C. Cells were passaged every 3–4 days after releasing with 0.002% pronase E in phosphate buffered saline (PBS). Cells were not used beyond passage number 40. MC3T3-E1 cells in treatment groups were grown for 24 h, then incubated with BMP-2 (50 ng/ml) or TGF-β1 (2.0 ng/ml) dissolved in PBS containing 4 mM HCl and 0.1% bovine serum albumin (BSA) at 37°C for 24 and 48 h. Control groups received equal volumes of vehicle only (PBS with 4 mM HCl and 0.1% BSA). MC3T3-E1 total RNA was prepared using an acid guanidinium isothiocyanate-phenol-chloroform extraction method . Sample concentration was estimated by optical density (OD) at 260 nm. 20 μg of total RNA per lane were fractionated by electrophoresis on a formaldehyde-containing 1% agarose gel and transferred onto Duralon membranes (Stratagene, La Jolla, CA). Northern blots were hybridized with random primer radiolabeled (Megaprime, Amersham) rat heart Cx43 and GAPDH (control) cDNAs in Rapid-hyb buffer (Amersham Pharmacia Biotech, Piscataway, NJ) at 60°C overnight. The blots were washed at moderate stringency and autoradiographs were analyzed with densitometry. MC3T3-E1 cell samples were lysed in 0.5 ml of RIPA buffer with slight modification (150 mM NaCl, 2 mM EDTA, 2 mM PMSF, 50 mM Tris-HCl, pH 7.4). 10 mM leupeptin and 2 mM sodium orthovanadate were added in the calf intestinal alkaline phosphatase (ALP) treatment groups. Cell lysates were sonicated (three 15 second pulses) and centrifuged at 4°C for 20 min. The protein concentration of each sample was determined by the Bradford method  using a BioRad protein assay kit (BioRad Laboratories, Hercules, CA). After alkalinization with NaOH to pH 9.7, one-half of each sample was treated with 1:500 diluted calf intestinal alkaline phosphatase (Sigma, St. Louis, MO) at 37°C for 3 h, and the other half was treated under the same conditions in the absence of ALP to demonstrate the phosphorylated isoform. The reaction was terminated by adding EDTA and heating the samples to 75°C for 10 min. 20 μg of total protein from each sample were separated using 10% SDS-polyacrylamide gel electrophoresis and transferred to Immobilon-P membranes (Millipore, Malborough, MA). The western blots were preincubated in blocking solution (5% nonfat milk, 0.2% Tween-20, 0.02% sodium azide in PBS, pH 7.4) at room temperature and probed with the primary anti-Cx43 polyclonal antibody (1:300 dilution; antibody against Cx43 C-terminus) for 1 h. The membranes were washed, incubated with the horseradish peroxidase-linked goat anti-rabbit IgG secondary antibody (Amersham), and developed using a chemiluminescence system (ECL kit, Amersham). Autoradiographs were analyzed with densitometry. MC3T3-E1 cells were cultured on 22 mm2 glass coverslips and treated with BMP-2 or TGF-β1. The cells were fixed with 50% methanol/50% acetone at room temperature for 2 min, 1 ml of 0.1% Triton X-100 for 5 min, followed by three washes in PBS. The coverslips were incubated in blocking buffer for 45 min and probed with the anti-Cx43 polyclonal antibody (1:50 dilution) at room temperature for 1 h. Goat anti-rabbit IgG secondary antibody conjugated to DTAF was used to visualize the immunolocalized Cx43. The coverslips were mounted on glass slides using Permount medium (Fisher Scientific, Irvine, CA) and randomly viewed and imaged using epifluorescence microscopy with a blue-green filter set. MC3T3-E1 cells were pre-incubated in methionine and cysteine-free culture medium for 45 min and labeled with 35S -methionine/35S-cysteine (ICN Biomedicals, Irvine, CA) at 37°C for 2 h. Cells were lysed in RIPA buffer as described above, incubated at 4°C for 10 min, vortexed, and collected in a microfuge tube on ice. The lysates were incubated and solubilized with 20% Triton X-100 at 4°C for 30 min and centrifuged. The membrane protein fraction was separated from the cytosolic fraction and reconstituted in RIPA buffer. Using the anti-Cx43 polyclonal antibody, Cx43 protein was immunoprecipitated, resolved with SDS-polyacrylamide gel electrophoresis (SDS-PAGE), and visualized by autoradiography. Mean ± S.D. was calculated from each of two or more independent experiments. One way analysis of variance (ANOVA) followed by student's t test was used to determine significance (p < 0.05). This work was supported in part by the Department of Veterans Affairs Merit Review funds (T.A.M. and D.T.Y. ), the Thomas and Arlene Bannon Foundation Research Fund (T.A.M. ), Plastic Surgery Educational Foundation research funds (A.I-K. and L.E.W. ), and NIH Individual National Research Service Fellowship F32-AG05708-01 (L.E.W.). We thank Yunfeng Liu and Defang Ma for their excellent technical assistance.